For thousands and thousands of Spanish-speaking members of Red Sox Nation, Juan Pedro ''J. P." Villaman was the voice, the man who screamed until he was hoarse and laughed easily as he told fans about David Ortiz's mammoth home runs, Manny Ramirez's adventures in left field, and the team's miraculous comebacks. Villaman, the Spanish-language play-by-play radio announcer for Red Sox games, died early yesterday when his Ford Explorer sideswiped a truck on Interstate 93 near Wilmington, rolled down an embankment, and slammed into a tree. He was pronounced dead at the scene. Police said he appeared to be speeding when he lost control of his sport utility vehicle. The driver of the truck was not injured, and no charges have been filed. Villaman, 46, was on his way home about 3:40 a.m. to Lawrence after broadcasting from Yankee Stadium over the weekend. On Sunday, Mother's Day in his native Dominican Republic, he had called the 88-year-old aunt who raised him and told her he loved her. ''He didn't know he was saying goodbye," said his cousin, Susie Villaman of Lawrence. 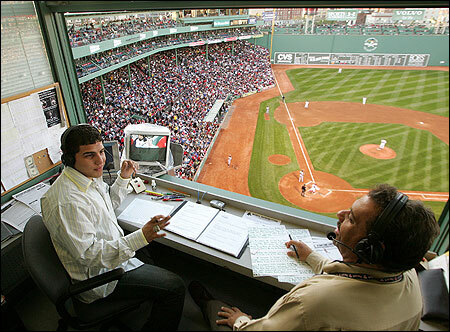 Villaman started broadcasting Red Sox games in Spanish in 1995 and was one of the first Spanish-speaking announcers in Major League Baseball. His broadcasts could be heard on a regional network of radio stations; by satellite in the Dominican Republic, Nicaragua, and elsewhere; and on cable broadcasts. Listeners called him ''Papa Oso" (Papa Bear). He was particularly close to Latin players on the Sox and received a World Series ring that he proudly displayed. He was an unabashed fan of the Red Sox, so enamored with the team that he would hug, even kiss, players before interviewing them. In Game 4 of the World Series last year, he got so excited when pitcher Keith Foulke threw the ball to first, sealing the Red Sox's 86-year curse-ending victory, his voice cracked during the broadcast. ''Boston gana!" (''Boston wins!") he screamed into the microphone seven times, so loudly his voice became raspy. His adoration was practically unprofessional, but Villaman did not care, said Uri Berenguer, his co-host for the last four years on WROL-AM, home of the Spanish Beisbol Network. ''He loved the Red Sox so much. J. P. saw the Red Sox as the almighty," Berenguer said. ''In J. P.'s eyes, the Red Sox could do nothing wrong." The death shook the Red Sox organization, which was still reeling from the death earlier this month of clubhouse cook Bernie Logue, who fell from the sixth floor of a parking deck after attending a Boston Celtics playoff game with some Sox players. Ortiz, the team's designated hitter and postseason hero, stood in front of his locker in the Red Sox clubhouse yesterday and recalled the last time he saw Villaman, a fellow Dominican. The broadcaster came into the clubhouse on Saturday before the game against the Yankees and began joking around with some of the players. ''Manny [Ramirez] and [assistant coach Ino] Guerrero were sitting there and he said, 'I love you guys,' " Ortiz said. ''We were making fun of him, laughing, making jokes, and he loved us. ''He was a guy that I remember every day had the same face," Ortiz added. ''Every time I see him, he had the same personality. He had a happy face. He loved doing what he was doing." Berenguer, along with Bill Kulick, president of the Spanish Beisbol Network, said they would broadcast last night's game with the Baltimore Orioles at Fenway Park. ''It's probably going to be the hardest thing to do in my career," said Berenguer, who broke down in tears between interviews and said he considered Villaman his mentor. ''I can say it is almost impossible, but I have to do it because I know that is what he would want." The loss of the charismatic broadcaster was also felt deeply in Lawrence, where he lived. At a neighborhood bar, Villaman's death dominated the conversation among the patrons. ''I cried when I heard it first this morning," said Ramon Perez, also a native of the Dominican Republic. ''He was the best announcer in Spanish or English. He was 100 percent into baseball. It was baseball at its best." The family considered taking his body back to the Dominican Republic, but his brother, Santiago Villaman, who came from New York with three of his sisters yesterday, said he will be buried in Lawrence, where his wife, Naomi, and three children live. ''Lawrence was his life," he said. ''He loved this city very much." And he was so well known in the city it was not unusual for people to bellow ''Papa Oso" on the street. The last time Santiago Villaman saw his brother was Sunday in New York, where J. P. Villaman visited his siblings before the game. He proudly showed his family his diamond World Series ring. It was the first and last time Santiago Villaman saw his little brother wear it. Villaman, the youngest of nine children, fell in love with broadcasting at an early age. At 13, he called baseball and basketball games from a local radio station in San Francisco de Macoris, in the Dominican Republic, where he was raised by his aunt, Orfelina Villaman, after his mother died giving birth to him. Orfelina Villaman became like a mother to him and obsessively followed his career, Villaman's relatives said yesterday. Often, she watched two televisions, one tuned to the game Villaman was calling, the other to the soap operas she adored, said Santiago Villaman. Villaman would say the same three things at the end of every game: ''Keep the faith. God bless you. This game is ours." Between the eighth and ninth innings last night, Berenguer said, ''J.P., this broadcast is completely yours, compañero." Globe correspondent Caroline Cole and Paul Harber of the Globe staff contributed to this report. Maria Cramer can be reached at mcramer@globe.com.